T.J. Oshie might not play a more eventful game than the one he participated in tonight against the Pittsburgh Penguins. 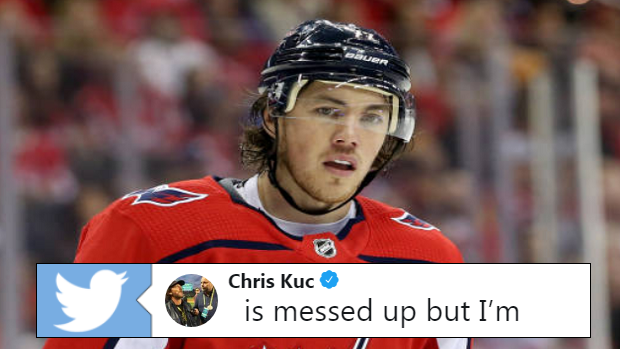 Oshie’s Capitals hosted their Metropolitan rivals at Capital One Arena where things got pretty ugly for Oshie in a hurry. For Starters, he briefly had to leave the game after taking a high stick and things took a turn for the worse in the third period on a scary collision with Evgeni Malkin. After dishing the puck off, Malkin delivered a high hit to Oshie which forced him to leave the game for a second time. But remarkably, Oshie manged to return to the game and scored the game-winning goal on a sweet pass from Jon Carlson. After the game, Oshie summed up how he was feeling with some pretty savage words. While Oshie was a little more chill about the hit, his coach Todd Reirden wasn’t exactly as relaxed about it. Capitals coach Todd Reirden on Evgeni Malkin's hit on T.J. Oshie: "Those are things we're trying to remove from the game. Of all teams, we know that from dealing with it on the other end." Reirden of course was referring to forward Tom Wilson, who was suspended 20 games for his illegal check on Oskar Sundqvist. Wilson has yet to play a game this season. JUST IN: NHL Player Safety announces that Capitals forward Tom Wilson has been suspended 20 games for an illegal check to the head of Blues forward Oskar Sundqvist. Time will tell if Malkin is disciplined but overall it was a pretty impressive performance form #77 in red.